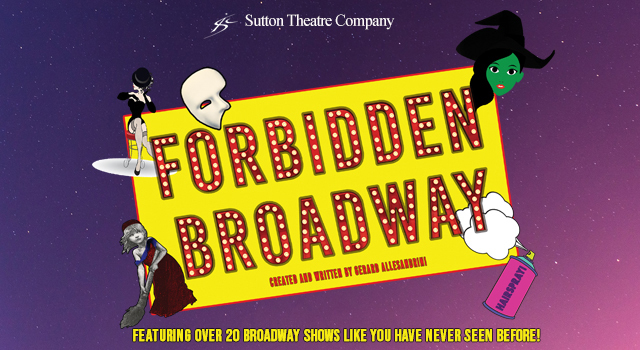 Join us on the forbidden side of Broadway!! Following their hugely successful productions of CATS, Bugsy Malone and Spamalot, Sutton Theatre Company (STC) are bringing the glamour of Broadway to the Epsom Playhouse this May – but not quite as you may know it! The multi award-winning FORBIDDEN BROADWAY is a hilarious cabaret revue sharply spoofing show tunes, characters and plots of many contemporary and classic Broadway musicals including Chicago, Annie, West Side Story, Wicked, Les Misérables, The Phantom of the Opera, Mamma Mia, Spamalot, Cats and Fiddler on the Roof; and Broadway greats such as Bob Fosse, Stephen Sondheim, Carol Channing, Cameron Macintosh, Liza Minelli and Barbra Streisand. This fabulous show features hilarious rewrites of your favourite songs and dead-on impressions by a brilliant cast. This is your chance to see the West End and Broadway's biggest shows and brightest panned, poked and lambasted all under one roof. Buy your tickets now to see over 20 musicals for the price of one!